Today’s secret recipe is for a tasty appetizer served at Panda Express. 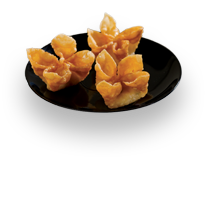 Cream cheese rangoons are prepared with a crisp wonton wrapper filled with a mixture of soft cream cheese and green onions. These make a great snack and are perfect for serving at your next party. These rangoons easily come together with 4 simple ingredients. Beat together the cream cheese and scallions. If desired a touch of garlic powder may be added for additional flavor. Spoon about 1 teaspoon of cream cheese mixture onto a wonton wrapper. Fold the wonton by brushing a little water over all of the edges of the wonton skin. Fold the wonton diagonally into a triangle. Be sure to seal all of the edges completely; this will keep the filling from running out of the wonton when being cooked. Take the two opposite corners and press and twist them together. You may need to tack them together by brushing with a little water. 1) Learn To Make Your Favorite Chinese Dishes At Home. 2) Snap A Photo And Sell It For Cash! Today’s recipe (shown below) is for a great quick and easy Chinese chicken dish. Recipes like this make it easy for you to bring international flavors to your home dinner menus. This recipe is only one of over 500 healthy and authentic Chinese recipes that are featured in the bestselling “Real and Healthy Chinese Cooking” cookbook. Combine chicken, celery, onion, soy sauce, ginger and pepper in 2 qt casserole dish, mix well. Cover and Microwave at HIGH for 5-8 minutes or until vegetables are tender and chicken is no longer pink, stirring twice. Blend cornstarch and water in 1 cup measuring cup. Add to casserole dish. Stir in remaining ingredients (except cashews). Microwave uncovered at HIGH (100%) 15-19 minutes or till mixture is thickened stirring 2 or 3 times. Sprinkle with Cashews. Serve over noodles or rice. 2) Learn to Cook Healthy Dishes In A Flash! 3) Gluten Free Chocolate Recipes Your Kids Will Love! Amazing collection of celiac friendly chocolate recipes.